was to have this hack menu driven and eliminate the mechanical switches. The first thing I needed to do was find somewhere on the Pac-man board I could control via code to replace the mechanical switches. 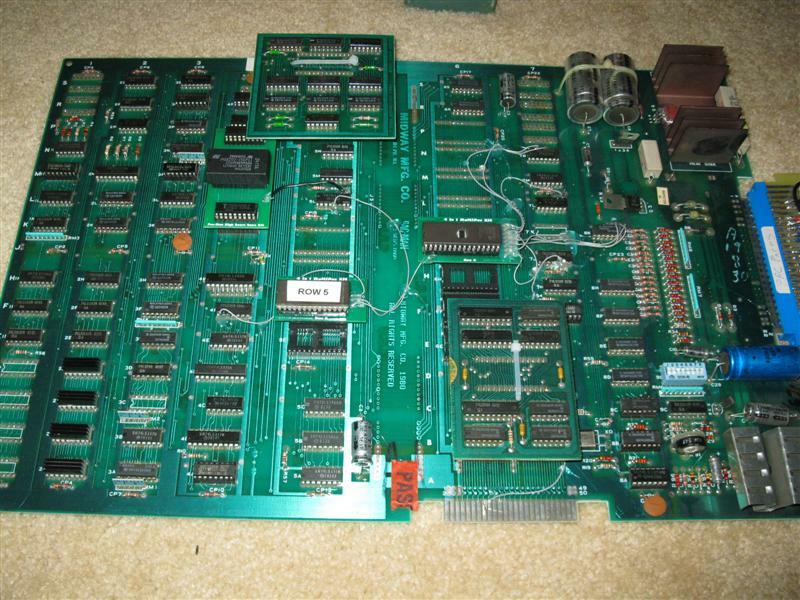 Looking through the many Pac-man resources on the internet I found that the latch at 8K has three outputs which it does not use. lock-out it is not taking anything away from the original game. I realized after playing around with my theory that there was a problem. When Pac-man starts up it clears all the pins on the latch. code to get rid of this step or the game will reset the first time the latch is cleared. job done. I am sure I will make modification to make it more fancy in the future but this is it for now. and shows pac-man and the ghosts bouncing around the screen. I may add to this in the future, but it does the job. Any movement of the joystick or pressing of the buttons will bring you back to the menu screen. game to change things like coinage, lives, bonus, etc. These can now be changed in the options menu. Change these names to anything you want before you burn the roms. instead of the mechanical switches. The 27c512 is a 28 pin DIP. The socket I used was 6J and is 24 pins. Bend up pins 1, 2, 20, 22, 23, 26, 27 , and 28. Place the new ROM socket in the pcb socket so that the bottom of the chip (opposite side from the notch) lines up with the bottom of the socket. This means that pin 14 of the chip should go into pin 12 of the socket. If you had not bent up pins 1, 2, 27 and 28 , they'de be hanging off. 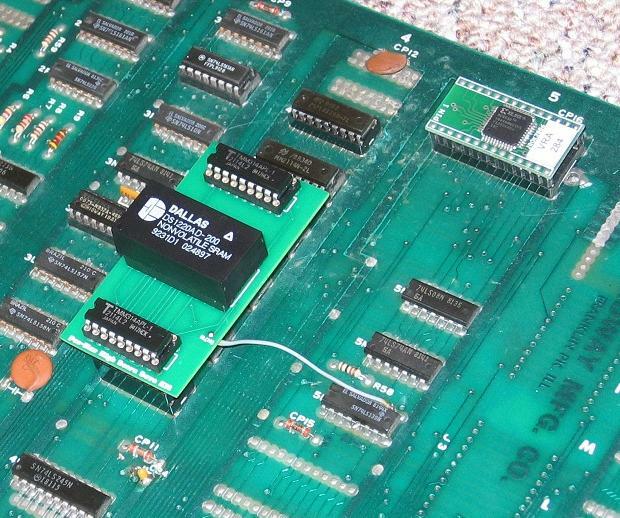 The actual pcb socket you use isn't important (as long as it's not 6K or 6L). We could use 6E, 6F, or 6H, but the daughterboard in 6D gets in the way. Connect pin 1 (A15) to 8K pin 11. Connect pin 2 (A12) to 7J pin 6. Connect pin 20 (CE\) and 22 (OE\) to 7N pin 12. Connect pin 23 (A11) to 7L pin 9. Connect pin 26 (A13) to 7N pin 14. Connect pin 27 (A14) to 6B pin 5 (test connector 8th "finger" from the bottom component side). I tapped into it at this side edge connector. Connect pin 28 (Vcc) to +5 volts. You can tap into this in a number of places. Pin 24 of every ROM socket has 5 volts on it. The 27128 is a 28 pin DIP. Bend up pins 1, 2, 20, 22, 23, 26, 27, and 28 on a 28 pin socket. Put the new socket into the pcb socket at 5E or 5F. Again, it doesn't matter which. Connect pins 22 (OE\) and 20 (CE\) to GND. You can pick up GND at pin 12 of any of the ROM sockets. You can also use pin 14 of the 27128 or pin 16 of the 27010. GND is always the top right pin of the EPROM (if you are facing the component side of the pcb with the edge connector towards the ceiling). Connect pin 23 (A11) to 4F pin 1. Connect pin 26 (A13) to pin 1 of the 27c512. Connect pin 2 (A12) to 5L pin 5. Connect pins 1 (Vpp), 27 (PGM\), and 28 (Vcc) to +5 volts. I just connected pin 1 to pin 28. I then globbed solder between pins 27 and 28. Then, I soldered another wire from the glob to pin 24 of another ROM position (5H). 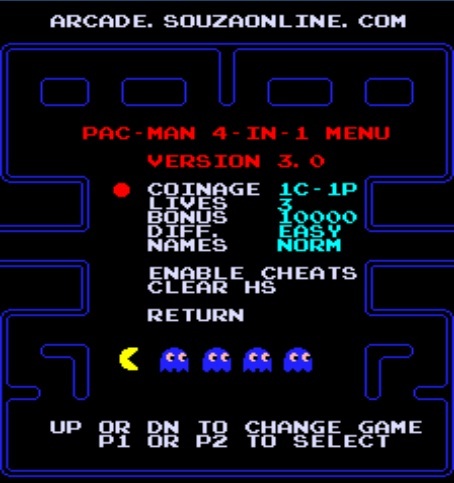 The row 6 EPROM has a new layout to include the menu and some other changes to the original Pac-man/Ms. Pac-man code. 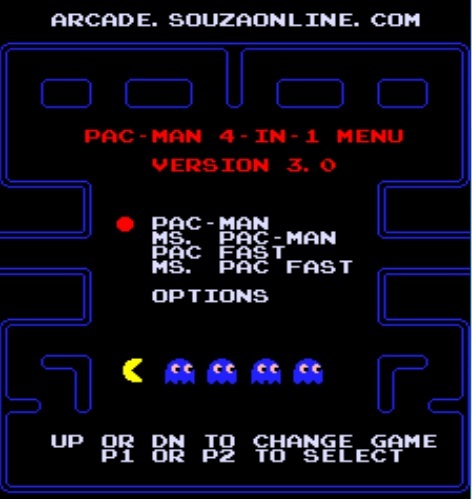 Pac-man and Ms. Pac-man have been modified to handle fast and slow versions in the same bank that is controlled by the menu. 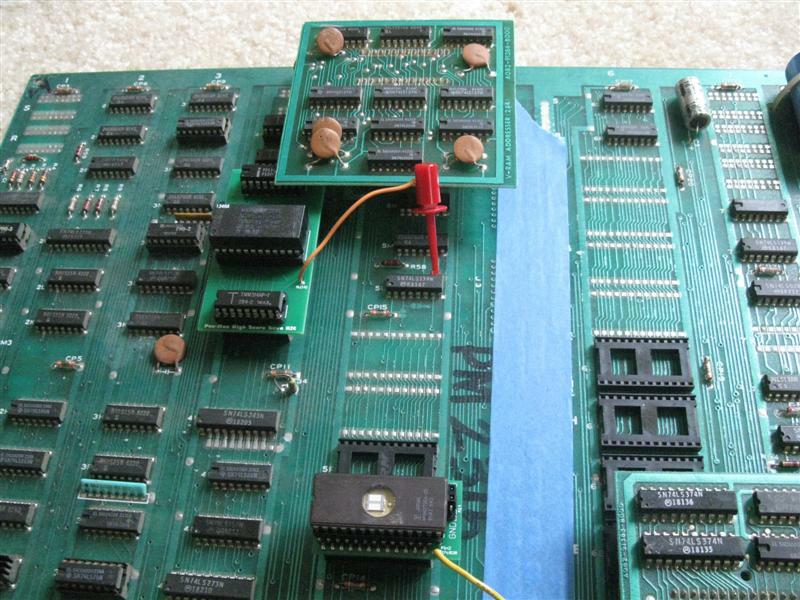 There was no need to take up two more banks of emprom space for a few bytes of code that were different.